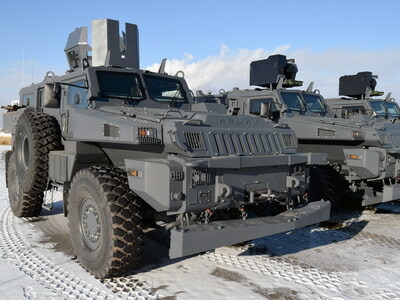 Kazakhstan Paramount Engineering (KPE), a joint venture between Paramount Group and Kazakhstan Engineering, is making use of Allison automatic transmissions for its armoured vehicle range. Allison said in a press release that KPE has chosen the Allison Transmission 3000 Series for its newest armoured vehicles. KPE currently produces or plans to produce the Arlan 4×4 AWV (armoured wheeled vehicle); the Nomad 4х4, and the Barys APC (armoured personnel carrier) in 6х6 and 8х8 versions. These are equipped with Cummins diesel engines and 6-speed Allison fully automatic transmissions. According to Deputy Director General at Kazakhstan Paramount Engineering, Johan Delport, the development of the drivetrain began in 2006. The company’s engineers compared several transmission solutions offered by various manufacturers by testing them in real-life scenarios. “When selecting the transmission to pair with the Cummins diesel engine, we focused on two basic factors. The first one is the simplicity and speed of integration, which impacts the production and maintenance speed. In this regard, the fully-automated Allison transmission was a very successful solution as it is quite popular and widespread, and it has shown good results in combination with this engine,” said Delport. Another important factor is that operating conditions in Kazakhstan are quite peculiar. The annual temperature range is about 100 °C, literally from +50 °C in summer to –50 °C in winter. This is the reason why the cooling system of the engine and the transmission and the power supply system have been significantly improved especially for Kazakhstan. However, one of the main advantages of fully-automatic Allison transmissions is the ease of operation in military vehicles: Allison automatics ensure an exceptional ease of handling, manoeuvrability and quick acceleration by smoothly multiplying engine torque and delivering more power to the wheels, Allison said. The driver can concentrate on the road without paying attention to gear change, which is highly important in combat conditions when every second counts.